I’ve kept my bird feeder full all summer, fall, and into winter in hopes that the cardinals who showed up in the spring would stay around. “My own” cardinals show up around dusk every night. I don’t have a good zoom on my camera and the light is pretty low, so I don’t frustrate myself by trying to capture them in my own photos. It has been enough for me to listen to their variety of songs all spring and summer, and to watch the male and female bring their 3 youngsters to my feeder all fall. I’ve watched the three juveniles grow their feathers out to become two adult males and one adult female. I look for them every late afternoon as I start to fix dinner, and they always show up right on time for their own evening meal. Tonight, though, they surprised me by letting another pair of cardinals join them. 3 females and 4 males. It was quite a sight! Although I still cross my fingers when I say it, I think they are here to stay. We have not had any snow yet this winter, but I’m sure we’ll see a storm or two before it’s over. I’m keeping stocked up on black oil sunflower seed so that when the ground is covered in white, I’ll still get to see flashes of red. ah, my favorite birdie…i would love to lure a family to my house but i fear a cat would get out and get one of them….they’re so bea-u-tiful! One of my favorites too. No squirrels on the island to compete for bird seed. And I “discourage” cats who try to hang around the feeder. 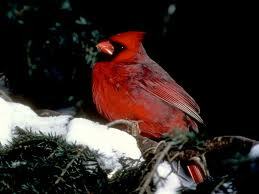 I have two pairs of cardinals that visit my feeder and have been with us since we moved to this house. Like you, I love seeing that flash of red as they show up for dinner. I hope yours will stay with you through spring and start the cycle all over again. LeAnn, did you get to see the males feed the females? Pretty sweet. 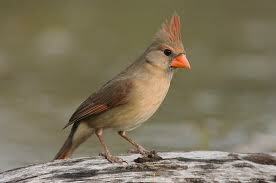 I remember lots of cardinals in Rochester too. I would always start to see them around our house in mid-February. Hope I see more of my guy here!!! 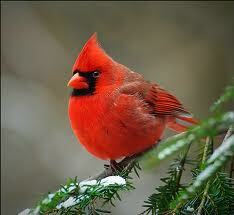 I was so glad to see your photo of the cardinal who just discovered your feeder. Hope he brings some friends.